I can’t remember the last time he opening paragraphs of a book grabbed me so. I read the English translation by John Cullen so if anyone reads the French language original I'd love to know how true this English translation is. I always say the best written book I have ever read is Michael Ondaatje’s The English Patient, well this comes a very close second. His (yes, Yasmina was a nom de plume) writing is lovely, packed full to the brim, every word significant, no wastage, yet not dense and impenetrable, unwieldy, but a luscious, rich, enveloping text. I love it! As it may be a less well known book in some circles, I'm sharing this opening to encourage you to read it…. "In the middle of nowhere, a whirlwind spins like a sorceress flinging out her skirts in a macabre dance; yet not even this hysteria serves to blow the dust off the calcified palm trees thrust against the sky like beseeching arms. Several hours ago, the night, routed by the dawn and fleeing in disorder left behind a few of its feeble breezes, but the heat has scorched and smothered them. Since midday not a single raptor has risen to hover above its prey. The shepherds in the hills have disappeared. For miles around, apart from a few sentries crouched inside their rudimentary watchtowers, there is not a living soul. A deathly silence pervades the dereliction as far as the eye can see. The Afghan countryside is nothing but battlefields, expanses of sand, and cemeteries. Artillery exchanges shatter prayers, wolves howl at the moon every night, and the wind, when it breathes, mingles beggars' laments with the croaking of crows"
The story centres around two couples: Atiq, the jailer and his sick wife Mussara. Atig is part of the Taliban regime, endorses their ideology, but is much trouble by his wife’s illness but won’t divorce her as his friends suggest because she rescued and took care of him in his hour of need and he is alive because of her nursing. But he is at a loss as to how to help his dying wife as she retreats more and more from him and he from her. The other couple, Mohsen and Zunaira, are well educated ex-middle class, but who have lost their family and home in the war. Theirs is a love marriage and they are both in their own way struggling to survive emotionally in the new order. They are handling their new circumstances and the restrictions and expectation placed on them in different ways : she is now reduced to a home based existence which she accepts as better than the out of doors that now exists - “here at home, as least, when I see my reflection in the mirror, I don’t have to hide my face”. But for Mohsen where they are living is a refuge, after their home was blown up, and a refuge he doesn’t want to die in, so he wants to be outside. As Mohsen mental state deteriorates under the strain, much to his real self’s disgust he participates in a stoning. When he confesses this to his wife, she is shocked and withdraws from him. Their happy relationship comes under more and more stress. The lives of these people become intertwined by an accident which catapults everyone to confront head on the morals of a justice system which permits an innocent person can be condemned to the horrific punishments delivered by the Taliban. The men collapse in this story, mentally and emotionally, they go to pieces. The analogy with the disintegration of values of societal structures, the destruction and decay of physical buildings and the unravelling of the men’s minds is not lost. 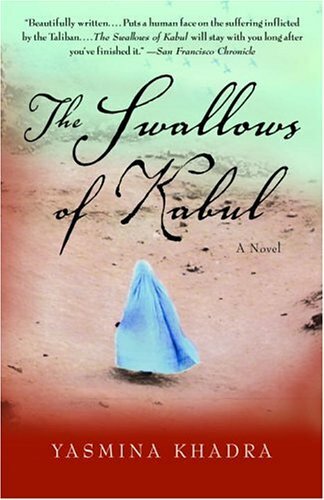 In contrast, it is the women who are strongest emotionally, are capable of carving out a continued albeit constrained existence, and even playing the system at its own game such that at the end of the book it is the women who have taken control, grabbed the opportunities, and are in command of their destiny and become the Swallows of the title, surviving and escaping Kabul. As the story of this group evolves, there are some great insights into human nature and the human condition scattered throughout the novel like sixpences in a Christmas pudding. Take for example Nazeesh, the ex mufti who is “not comfortable at home'” because of the presence of his aging father. A powerful story given a truly human perspective to the disintegration of a society at war with itself and others. Well told. A recommended read. What % of your income do you spend on food? Chivalry is alive and well! Ants – storm troupers extraordinary! Cold Soups for Hot Days!